Superbly crafted, with a broad sonic palette to draw from. Beyond the 335 indeed. Good build. Classic looks. Loads of tonal options. No rear-access to electronics. Nut smaller than spec'd. The 335-inspired Black Label Elise from UK firm Fret-King has been well documented on this site, but this John Etheridge signature is so new the paint is barely dry. "This sample impresses, as it's lighter than the previous Elises we've tested"
Essentially the same as the standard Fret-King Elise in terms of its Korean origin and solid-wood construction, this sample impresses, as it's lighter than the previous Elises we've tested. As a result, played seated, it sits on your lap rather than having the tendency to slip off due to the weight of the body and its balance point. Another change here is the three-a-side headstock, unlike the back-angled Trini Lopez-style six-in-a-line head of the standard model. It gives the guitar a more classic vibe that's less racy. And that's the aesthetic here: from the beautifully rich honey finish to the ultra tidy faux tortoiseshell around the top of the body, fingerboard and even the ebony pickguard (unique to this model). One thing that isn't correct on this example is the nut width. Here, it's a regular 43mm, but Etheridge has spec'd a 45mm width, which will give air in lower positions: ideal for complex chords and picking. Along with an altered layout for the volume, tone, Vari-coil and pickup selector toggle, another change here is the ebony 'trapeze tailpiece'. It looks like a standard floating wooden trapeze that you'd find on an archtop, but in typical Trevor Wilkinson style there's a twist. Not only is the tailpiece glued down to the body - it doesn't float - but we have through-body stringing. It means the strings exit over small rounded-edge ferrules, but at quite acute angles that could preclude the use of flatwound strings - something for any old-school jazzers to bear in mind. Also, perhaps strangely given the flat solid back, there's no rear-access electronics cavity - any electronic maintenance has to be done through the f holes. 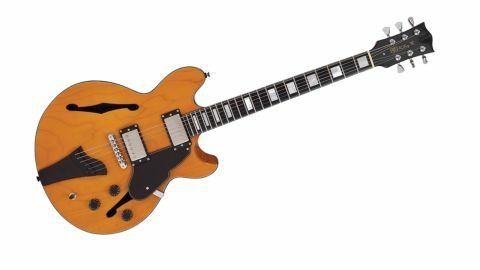 "With its downsized, offset ES-335-meets-mini-archtop vibe, the Fret-King is a superb guitar"
Clean, it captures plenty of the 335's snappy percussion, but the Vari-coil could be renamed 'colour': fully clockwise (humbucking) it nails a very PAF-like low output 'bucker tone that already has plenty of single-coil-like character. As you turn the control anti-clockwise, the sound thins out, and fully 'off ' (single coil, voicing the screw coils only) has bags of sparkle and bite. The neck humbucker has the right amount of plumy-ness; back the tone off a little and the clarity smoothes a little; knock the Vari-coil back and it's like a slightly underwound P-90. With crunchier tones, there's a very Robben Ford openness, but it's hard to be definitive because there are so many colours here. With its downsized, offset ES-335-meets-mini-archtop vibe, the Fret-King is a superb guitar.